← An Exclusive Discount Code and Free Gifts at Bodykind! I grew up with potato salad that came in tubs from the supermarket chiller section. Cubes of potato in a gloopy, brilliant white sauce with flecks of green. My mums homemade salad tasted way better and I could devour too much as a child. But it was merely new potatoes smothered in a cholesterol laden bucket load of mayonnaise with crunchy spring onions. 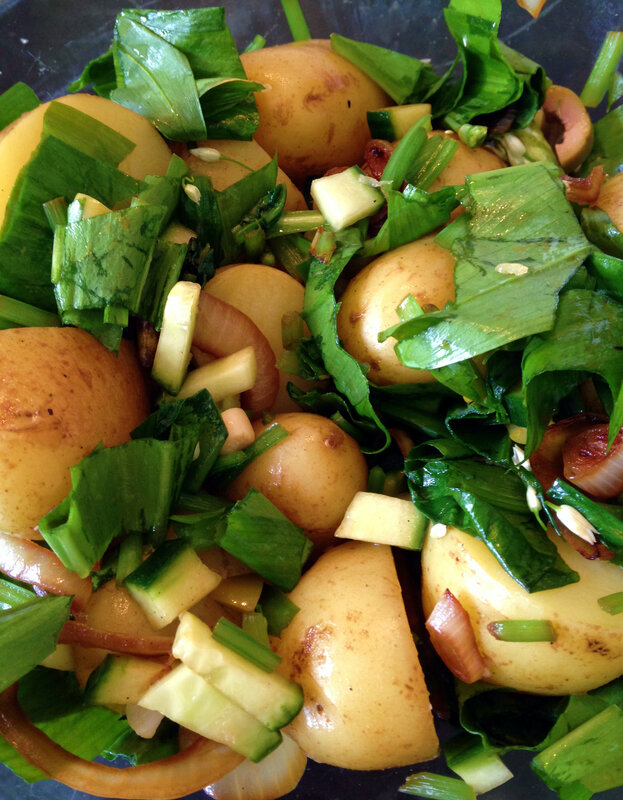 As I grew up even before I became vegan, my mums potato salad was something I would very rarely make in my own home, as I began to understand just how calorific it was and how little self control I had with it. I knew no different way. That was potato salad to me and if I couldn’t have it then that was that. In more recent years as my interest in flavour combinations developed, especially since becoming a vegan, I attempted to make potato salads non reminiscent of the mayonnaise drenched versions I had only known, that were delicious in their own right. I spent the first couple of months of veganism toying with attempts to make vegan versions of vegetarian favourites. Macaroni cheese was the classic. I tried almost every trusted, highly reviewed vegan mac and cheese recipe. None of them tasted like real mac and cheese, so I’d toss that recipe out and move on to the next. Then one day I realised, it was never going to taste the same as real cheese, how could it? But the food is delicious in it’s own right. If I stopped comparing everything to a dairy alternative, it was delicious anyway. This was the most important realisation I had in my first months of veganism. Take almond milk for example. Of course it doesn’t taste like cows milk, why would it? But it is delicious and I can’t imagine life without it and now couldn’t be more glad that it doesn’t taste of cows milk! The trouble is, it is easy, especially at first, to expect or at least try to create, non dairy products to taste like dairy. Just as non-vegans tend to do. My boyfriend will taste a nut cheese and instantly discuss whether or not it tastes like dairy cheese. Now I taste it for what it is, a nut cheese. This recipe was a breakthrough for me in terms of this. 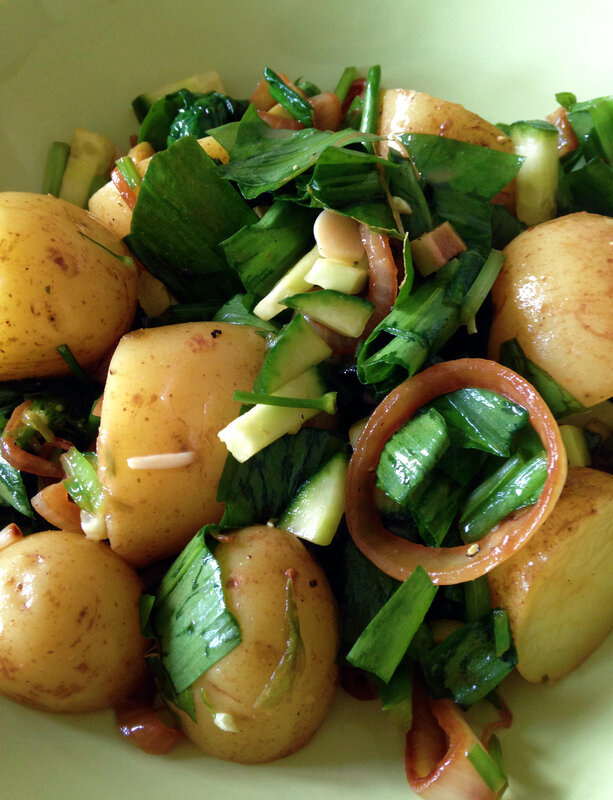 This recipe confirmed that I didn’t have to stick a jar of vegan mayo and some spring onions in a bowl of potatoes to make a potato salad taste almost how I remembered it. Instead, use natures gorgeous flavour enhancers and erase the idea of the past recipe as your starting point. Start again, make a masterpiece, a recipe you love and will make over and over again that just is what it is. Delicious. Slice the onion into rings and add to a non stick frying pan and cook and stir over a low-medium heat until golden and caramelised. Meanwhile, wash and halve the potatoes if large. Add to a large pan with the stock and cover with cold water. Bring to a boil and simmer for about 15 minutes until knife tender. Make the dressing, squeeze the juice of the lime and add to a small bowl, add the mayonnaise, vinegar and chia seeds and whisk together, add just a little salt and pepper and stir well. Slice the leaves, cube the cucumber and slice the olives. When the potatoes are ready, drain and put under cold running water to cool quickly or leave to cool if making in advance. 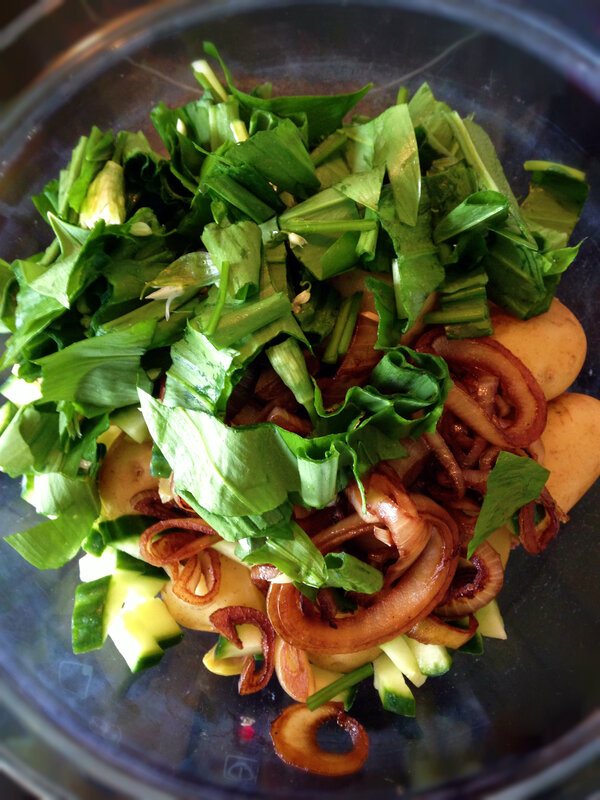 Drain thoroughly and toss with the onions, cucumber, wild garlic, olives and dressing. This entry was posted in Egg-free, Gluten-free, Lunch, Mains, salads, Side dishes, vegan, Vegetarian and tagged food, healthy, potato, potato salad, recipe, salad, vegan, vegetarian. Bookmark the permalink. I enjoyed reading your story and regarding making comparisons of vegan foods to the dairy counterparts. I’m not a vegan, however I found it really interesting and I’m sure I would do the same! 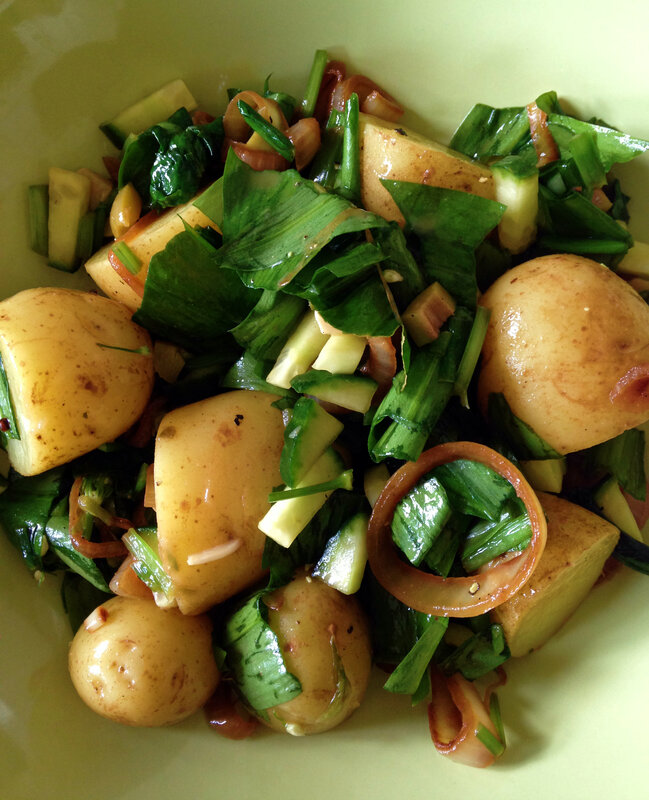 Your salad is really beautiful especially with the caramelized onions and the rocket. The addition of olives sounds wonderful as well. Thank you very much for your comment. I think at first it is hard to not make comparisons especially if non dairy alternatives are new to you! Two of the best ingredients. . . potatoes and caramelized onions. Does it get any better? You said caramelized…mmmmm! I’m totally with you – no need for the (vegan) mayo on potato salad. Let the main ingredients shine! Yum! This makes me want to bite at my screen. This looks wonderful, can’t wait to make it. Thanks for sharing. Thank you Mike, I hope you enjoy it! I love potato salad, it is also one of my favorite childhood treats. It is a Taiwanese potato salad, involving sweet Japanese mayo, carrots and egg (I hate it), and I veganised it last year and it was pretty delicious. Wow I’m coming to check out how you veganised that – assuming it’s on your site?! I never got the egg in potato salad thing, I think it’s more of an American thing? Never really see it here in the UK. 😦 hope it gets better soon! It looks totally scrumptious, Poppy. It looks so delicious! Your points are so good, Poppy! As soon as we appreciate the food for what it is and not comparing it to the ‘real thing’, we realize how delicious it really is. Ah! My kind of salad! Every ingredient has its texture and burst of flavors. Caramelized onion the surprise of them all, which that is why the name of this salad! Brilliant! Yes, that’s what I love about it, it’s not boring, every bite is a different taste experience and I just love the onions, they work so well with the soft potatoes and crunchy greens! This looks great! I love how caramelized onions make a dish so special. They do indeed! I love them in anything! 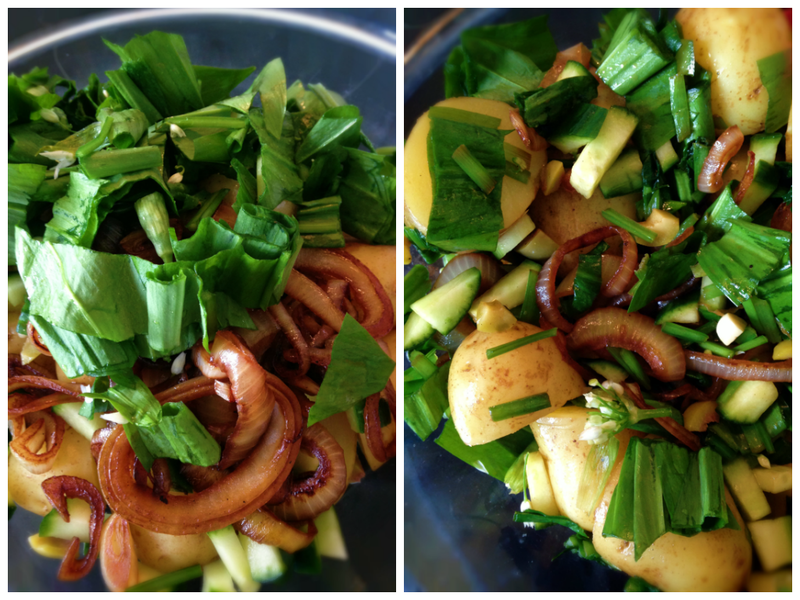 Potato salad with caramelized onion is a very nice idea….gonna try this soon !! This looks INCREDIBLE!! Can’t wait to try it.